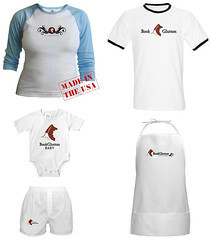 You ask and we deliver – you can now get some BookGlutton gear from CafePress – printed on demand at www.cafepress.com/bookglutton. BTW, they’re priced nearly at cost and ship all over the place. Don’t you want to tell the world what a BookGlutton you are?